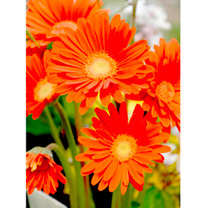 Dramatic gerberas are no longer just a houseplant – this hardy plant will thrive in the garden. And, once stablished, each plant will produce up to 100 blooms during the course of its long flowering season. Flowers April-October. Height 20-30cm (8-12). Supplied in a 9cm pot. Far too early to think about planting them but I’ve got my thinking cap on for what I want to grow next year. 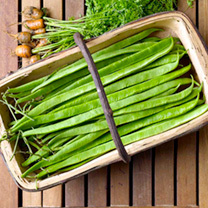 Short-jointed plants producing an enormous crop of very long, smooth, slender beans of excellent shape and colour. Great beginner variety. RHS Award of Garden Merit winner. Recommended by the National Institute of Agricultural Botany. Following in the same vein as Moonlight, Firestorm and Tenderstar. 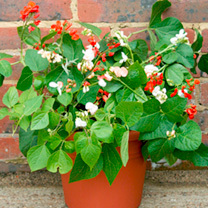 This is a cross between dwarf french beans and runner beans, producing huge yields of full size runner beans from compact plants.Pink, white & bicolour flowersHuge yields on compact plantsPerfect for pots & containersTom says: The baby of the family of next generation runner beans, this time crossed with a dwarf French bean to give the flavour and look of runner beans on compact self-fertile plants. 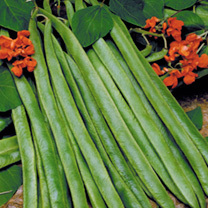 A first-rate, stringless runner bean, producing an abundant crop of 25-30cm (10-12) long beans over a long period. Very good flavour and popular with local allotment holders who have trialled it. RHS Award of Garden Merit winner. Self-pollinating and stringless. Contains Moonlight & Firetorm in equal quantities. 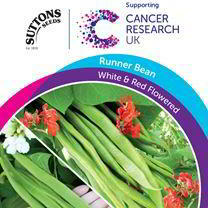 Harvest July-October.Self-pollinating stringless beansAttractive white and red flowersHigh yields all summerLong tender stringless beans25p from the sale of each promotional pack goes to Cancer Research UK. 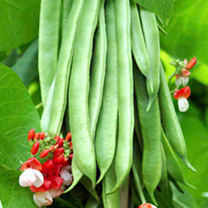 This new generation French-Runner bean cross sets beans easier, producing masses of 18-20cm (7-8) long pods throughout the summer whatever the weather. It boasts a good flavour and exceptionally tender texture. And the bicoloured red-and-pink flowers are extremely attractive too! 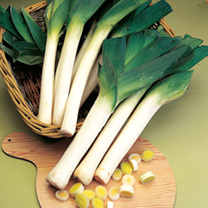 I love leek and potato soup so I grow lots of leeks! It’s very nearly time to start sowing leeks again! I started them off in a polystyrene fish box this year and they did grow better in the depth of soil. I grew four varieties and then mixed them up when I was planting them out. Whoops! I dib them in as deep as possible so you get more of the white part. This means it’s more effort digging them up, but the reward is worth it. You can use the darker bits in leek soup but they make it a much darker colour! I cook leeks, potato and a chicken stock cube until they’re soft and then blend it! Delicious with fresh buttered bread. Leek Seeds – Musselburgh£1.99An extremely winter hardy variety. Good length, tasty white stems. A milder flavour substitute for onions in many culinary dishes.Thick, white, tasty stemsExtremely winter hardyTraditionally popular varietyHeritage Seed Vareity, 1919 packet details – Greatly improved stock of Musselburgh leek, far superior to the ordinary strain. Highly Commended, Royal Horticultural Society, 1918. This is a really hardy leek! We like this sort as they will stand through a bad winter until you want to eat them! Someone on our allotment recommends Pablo. It’s an F1 and gives him great results every year. 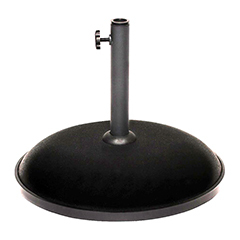 An excellent item for both table and exhibition use. The exceptionally uniform, round, smooth skinned roots have an attractive rich red internal coloration and stand for a long period without becoming ‘woody’. Very tasty. RHS Award of Garden Merit winner. My own hints are to start saving big jars so you can pickle the delicious beetroot you grow! I’m a huge pickled beetroot fan! You need big jars so you can keep the beetroot in slices. 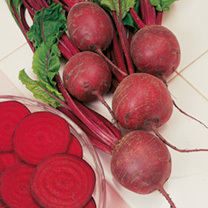 If you only manage to grow tiny beetroots you can still pickle them. 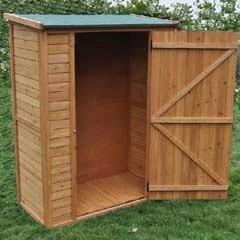 As the end of the year draws near it’s time to come up with a fresh batch of new years resolutions, Maybe this will be the year you can get ahead with your garden and really plan out some bumper crops, try some new additions in your veg patch, take part in a growing competition or maybe even use your garden produce to make something new in the kitchen. If you’re looking for some inspiration take a look below at some of our bestselling items and maybe add them to your list this year. If you’re looking for inspiration on what to grow next year then this list from suttons will give you some great ideas.